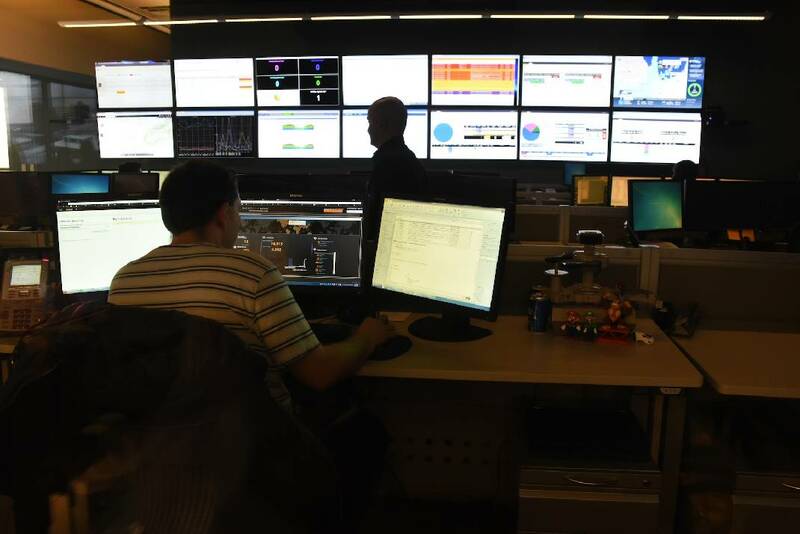 EPB last month topped 90,000 subscribers to its fiber optic system, nearly triple the number the utility originally projected it needed to break even when the fiber optics network launched in 2010. The city-owned electric utility has continued to add customers for its video, internet and telephone services even after surpassing rival Comcast as the No. 1 provider of telecommunications in its Chattanooga area footprint. Although Comcast has more total subscribers across Southeast Tennessee and Northwest Georgia, more than half of EPB's 160,000 electric customers are also signed up for at least one of the three telecom services from EPB. Last week, EPB said it had 83,332 residential fiber customers — 72,139 of which get at least EPB's internet service — and 6,923 business fiber customers. EPB was the first internet provider in America to provide high-speed fiber optic links to all of its customers to ensure gigabit-per-second web links years before others provided such high-speed broadband connections across the community. 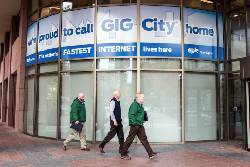 EPB has labeled Chattanooga "the Gig city" for its ultra-fast internet service. "Our original board decision to undertake fiber optics has proven to be very solid and a great asset for our community and our electric system," EPB Chairman Joe Ferguson said Monday. "We initially determined we needed about 35,000 customers to pay for our fiber optics network, but we have far exceeded that number and it continues to grow every day." EPB initially installed its fiber optic network across its electric service area to create a so-called "smart grid" capable of quickly diagnosing and correcting power breaks and other electricity delivery problems. Over the weekend, EPB estimates the smart grid prevented or automatically restored power outages to about 17,800 customers during storms Saturday and Sunday night. The fiber optic lines also allowed EPB to enter the cable TV, telephone and internet business after the Tennessee Legislature authorized such municipal broadband service within the utility's service territory. Although private cable TV and telephone companies raised concerns about competing with a government utility, Ferguson said EPB has paid tax equivalent payments to local governments sufficient to make EPB the top payer in Hamilton County of local taxes. Through the first three quarters of its fiscal year, EPB Fiber also generated more than $111 million in telecom revenues, generating a $14.5 million net profit and paying enough back to the electric system to help pay for the power system's smart grid. EPB Chief Financial Officer Greg Eaves told EPB directors last month that the success of the fiber optic telecom system offered by EPB has helped keep electric rates 7 percent below what they would otherwise be without the telecom services. "It's proved out a business model that is very effective and one that could be played out on a national level," said J. Ed. Marston, vice president of marketing and communications for EPB. "We've proven that this subscriber- funded model for building both a smart grid and a fiber optic communications network provides a valuable asset for our community and actually helps to lower power rates." Nonetheless, EPB's venture into fiber optics has drawn criticism from conservative critics and rivals wary of government-owned utilities competing against privately owned cable TV, telephone and internet business. The initial $220 million investment in the fiber optic system was funded, in part, by a $111.6 million federal grant provided as part of the federal stimulus program in 2010 designed to spur jobs and the development of a smarter electric grid. Critics of the government-backed project argue private utilites are at an unfair disadvantage competing against a government utility that gets extra federal funds and doesn't have to generate a profit for its owners. In 2014, the Washington Times gave EPB's fiber optic system its "Golden Hammer" award designed to highlight waste, fraud and abuse. A conservative think tank opposed to city utilities getting into competitive telecommunications — the State Government Leadership Foundation — also has minimized the benefits of Chattanooga's ultra-high-speed internet service while raising doubts about its potential costs to city taxpayers and electricity users. George Ford, chief economist for the Phoenix Center for Advanced Legal and Public Policy Studies, said EPB got the equivalent of $2,000 per customer in federal subsidies to build its citywide fiber optic network Ford said other government-owned utilities, such as one in Bristol, Va., have gotten $7,000 or more per subscriber to add telecommunications services that compete against private companies such as AT&T, Comcast and Charter Communications. "The incumbent private sector providers are not offering broadband service in some areas because there is no money in serving those folks," Ford said. "The bet is so bad that no economic actor would do it, so you find some uneconomic political actor to do it, which immediately spells trouble." But backers of EPB's fiber optics network insist the utility's investment has already paid off in a smarter electric grid, better telecom services and more economic development in Chattanooga. An economic study by Bento Lobo, professor of finance at the University of Tennessee at Chattanooga, said EPB's fiber optics network in its first three years saved $130.5 million in power outages, boosted business energy efficiency by $234.5 million and spurred $461 million in new business investment. Despite such advantages, the Tennessee Legislature this year declined to adopt a proposal to allow municipal utilities such as EPB to expand their broadband services outside of their power service territory. Ferguson said EPB is willing to work with electric cooperatives, which were granted the authority to enter the telecom business, or other municipal power utilities which want help expanding into telecommunications.